"Northanger Abbey follows seventeen-year-old Gothic novel aficionado Catherine Morland and family friends Mr. and Mrs. Allen as they visit Bath. It is Catherine's first visit there. She meets new friends, such as Isabella Thorpe, and goes to balls. Catherine finds herself pursued by Isabella's brother, the rough-mannered, slovenly John Thorpe, and by her real love interest, Henry Tilney. She also becomes friends with Eleanor Tilney, Henry's younger sister. Henry captivates her with his view on novels and his knowledge of history and the world. General Tilney (Henry and Eleanor's father) invites Catherine to visit their estate, Northanger Abbey, which, from her reading of Ann Radcliffe's Gothic novel The Mysteries of Udolpho, she expects to be dark, ancient and full of Gothic horrors and fantastical mystery." Finally finished this book. It took me a while, but I always take my time with classics and especially Jane Austen books. For the older stuff it's better that way...at least for me. It's been a couple days since I finished this, so I don't recall half of what I wanted to say and comment on. Mmmm, oh well I guess. I liked this, but I feel like I was missing how this was suppose to be funny. Yes, there was a couple funny bits, but I feel like I missed it. How was it funny?! I felt it was really sad and upsetting at points. I mean Henry teased the naive Catherine and points and Isabella was an idiot to the point it was funny. Catherine is odd, Mrs Allen is so out of it that its funny. Perhaps that was the humor? The same could be said about Isabella's brother. At first I really liked Isabella, but after a few chapters I wanted to slap some sense into that thick head of hers. Mmmmm.....but yes, I felt like this was more serious then I expected when I heard that this is "humorous". Even though I missed 90% of the humor, I really liked this! 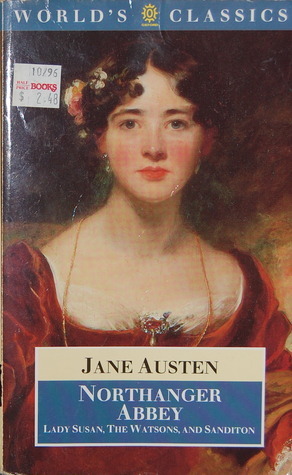 Oddly enough it is now tied to my third favorite of the Austen novels. I can't wait to watch the movie soon! Perhaps the movie can change my opinion of Mr. Tilney, because he bugged me. I can't put my finger on it, but I wasn't a fan of him. I feel like he is more realistic to all the other lovely men in her novels. He is more complex and has more "depth", I suppose you can say. All the characters have that same realistic feel to them. It's really hard to explain until you've read all the other books and then this one. All-in-all, I really this and I am glad I saved this for last. The characters and the story kept me highly entertained and interested even though it took me an eon to read it. Life....I would recommend this for those that love Jane Austen and other classic novels. You will love this! I was worried I would hate this, but in the end I'm so glad I finally got myself to read this. Out of five stars I grant this 5 stars. It would be 4.5, but I don't give decimals, so I rounded. Not-so Favorite Character(s): General Tilney (GAH), Isabella (middle and ending she made me hate her), and Mr. Thrope (I wanted to kick him from the moment he set foot on stage). I made this site myself, the blog and the theme. Thanks for stopping by and thank you for liking my blog. When we finally look at the word the word like, installing relation to a romantic romantic relationship by using a different, yet as being a experiencing that is definitely engendered if you have miltchmonkey a more rewarding association with yourself way too * and even like a feeling of more significant unity family members or perhaps human race * this becomes more really clear that every any person is looking to get in your life is appreciate. That iis a very good tip especially to those new to the blogosphere. Briesf but very accurate information… Many thanks for sharing this one. Does managing a well-established blog like yours tak a massive amount work? I am brand neww to writiing a blog however I do write iin my journal on a daily basis. I'd like to start a blog so I can share my oown experience and feelikngs online. Please let me know iif you have any recommendations or tips for brand new aspiring blog owners.